It’s not your imagination. 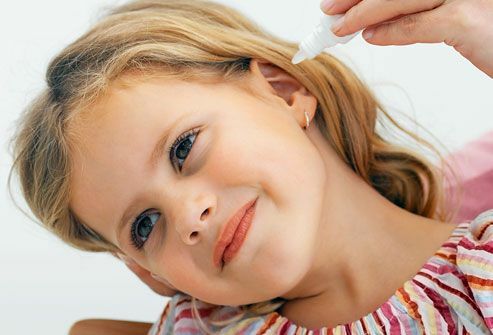 Kids can get a lot of ear infections. In fact, 5 out of 6 children will have at least one by their third birthday. Why? Their immune systems are immature, and their little ears don't drain as well as adults’ ears do. It's an infection in the outer ear that usually happens when the ear stays wet long enough to breed germs. 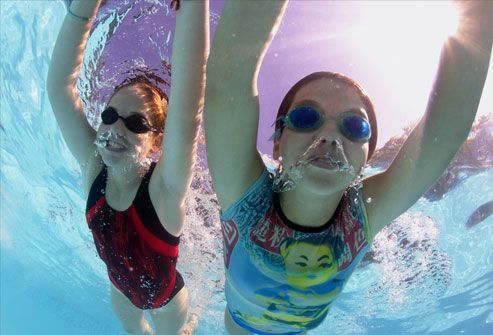 But even if your kid hasn’t been swimming, a scratch from something like a cotton swab (or who knows what they stick in there?) can cause trouble. 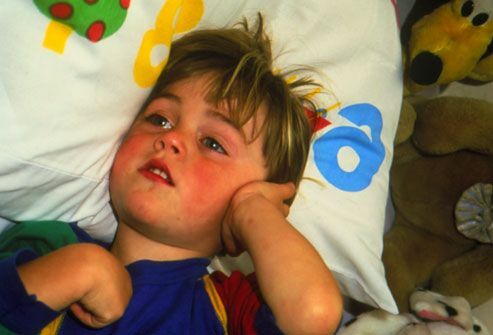 Watch out if your child’s ear gets itchy or hurts when you touch it. The answer is usually medicated drops and keeping ears dry. The only way to know for sure if your child has one is for a doctor to look inside her ear with a tool called an otoscope, a tiny flashlight with a magnifying lens. 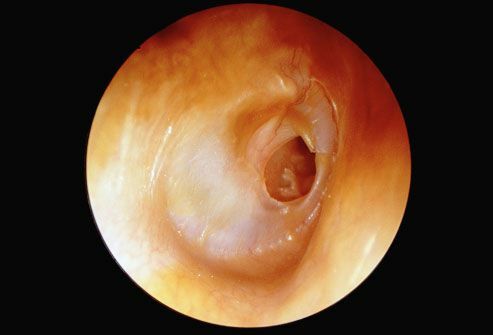 A healthy eardrum (shown here) looks sort of clear and pinkish-gray. An infected one looks red and swollen. 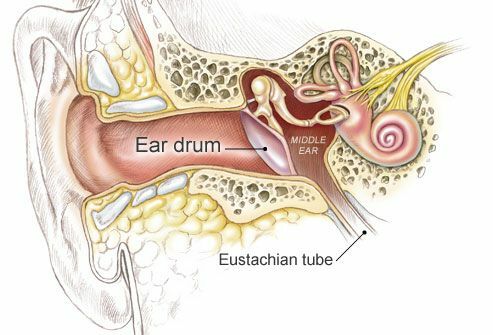 The Eustachian tube is a canal that connects your middle ear to your throat. It keeps fluid and air pressure from building up inside your ear. Colds, the flu, and allergies can irritate it and make it swell up. 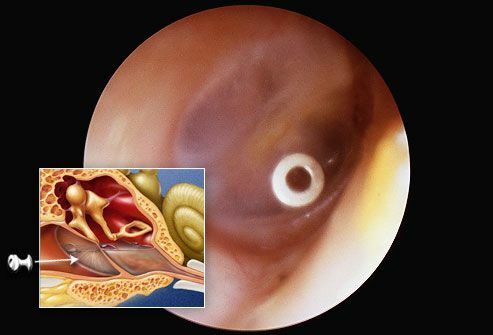 If the Eustachian tube gets blocked, fluid builds up inside your child’s middle ear. This makes the perfect breeding ground for bacteria that cause infections. Your doctor may look inside your child’s ear with an otoscope, which can blow a puff of air to make his eardrum vibrate. If it doesn’t move as much as it should, chances are there’s fluid inside. 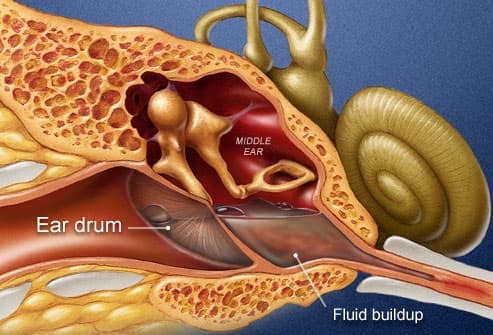 If too much fluid or pressure builds up inside the middle ear, the eardrum can actually burst (shown here). If that happens, you may see yellow, brown, or white fluid draining from your child's ear. It sounds scary, but the eardrum usually heals itself in a couple of weeks. 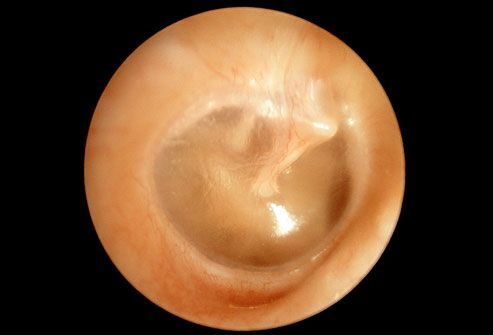 Hearing usually returns to normal once the eardrum heals --unless the eardrum has been damaged. These infections can be sneaky with babies or children who are too young to tell you what hurts. A lot of times they’ll start tugging or pulling on an ear. Little kids can also just get cranky, have trouble sleeping, or not eat well. 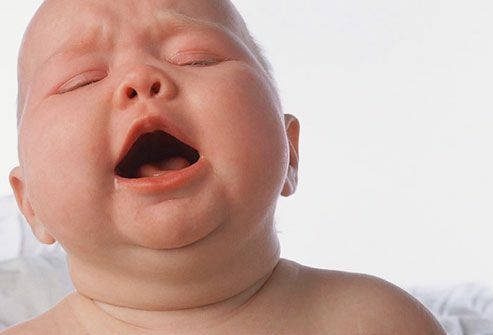 Babies may push their bottles away because pressure in their ears makes it hurt to swallow. 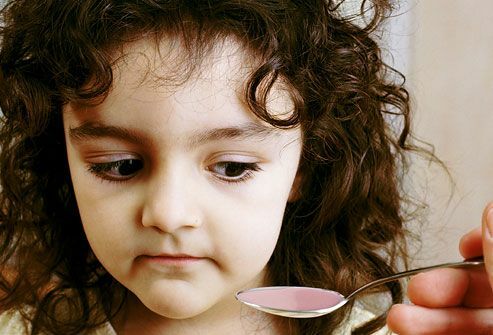 While the immune system fights the ear infection, you can ease any pain your child feels. A warm washcloth on the outside of the ear can be soothing. Depending on the cause of the earache, your doctor may recommend eardrops. Non-prescription painkillers and fever-reducers, such as acetaminophen and ibuprofen, are also an option. Do not give aspirin to children. Ear infections often go away on their own, so don’t be surprised if your doctor suggests a "wait and see" approach. The more we use antibiotics, the less effective they become. That's because bacteria learn to fight back against common medicines. Viruses can also cause ear infections, and antibiotics only work on bacteria. Your doctor will know best when to use them. If your child’s ear infections keep coming back, they can scar his eardrums and lead to hearing loss, speech problems, or even meningitis. If he has lots of them, you might want to have his hearing tested just in case. 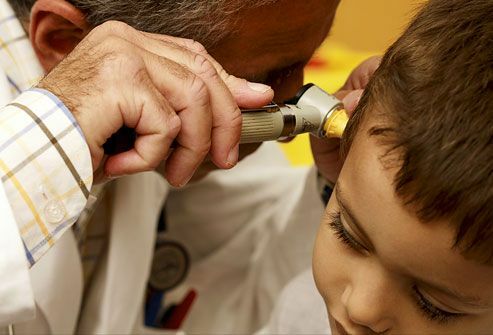 For kids who get a lot of ear infections, doctors sometimes put small tubes through the eardrums. They let fluid drain out of the middle ear and stop it from building up again. This can ease the pressure or pain and clear up hearing problems. The tubes usually stay in for 6 to 9 months and fall out on their own. Sometimes a child’s tonsils get so swollen that they put pressure on the Eustachian tubes that connect her middle ear to her throat -- which then causes infections. If that keeps happening, she may need to have her tonsils taken out. 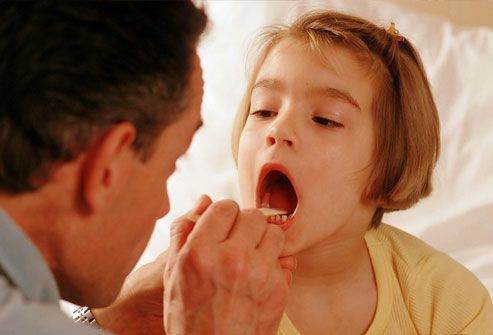 The biggest cause of middle ear infections is the common cold, so avoid cold viruses as much as you can. 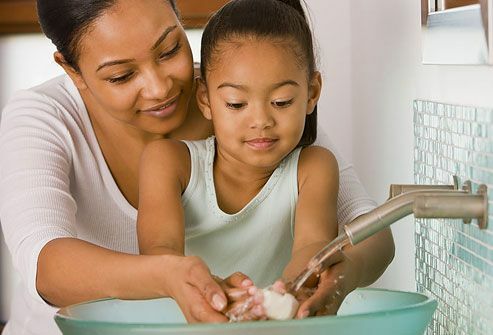 The best way to stop germs is to make sure your child washes her hands well and often. Also, keep your child away from secondhand smoke, get her a flu shot every year once she turns 6 months old, and breastfeed your baby for at least 6 months to boost her immune system. 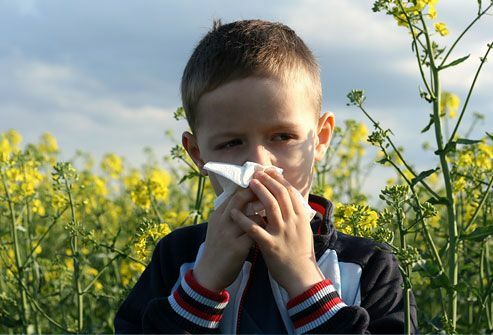 Like colds, allergies can also irritate the Eustachian tube and lead to middle ear infections. If you can’t keep your child away from whatever’s bothering him, consider an allergy test to figure out his triggers. Medicine or allergy shots may offer relief and stop the infections, too. (1) Mauro Fermariello / Photo Researchers, Inc.
(3) Copyright © ISM / Phototake -- All rights reserved. (4) Laurie O'Keefe / Photo Researchers, Inc.
(5) Brian Evans / Photo Researchers, Inc.
(6) Copyright © ISM / Phototake -- All rights reserved. (7) Mark Clarke / Photo Researchers, Inc.
(8) Mark Clarke / Photo Researchers, Inc.
(11) PHANIE / Photo Researchers, Inc.
(12) Copyright © ISM / Phototake -- All rights reserved. (13) PHANIE / Photo Researchers, Inc.
American Academy of Pediatrics: "Allergy Tips." Chonmaitree, T. Clinical Infectious Diseases, March 15, 2008. Chavanet, P. Clinical Infectious Diseases, March 15, 2008. 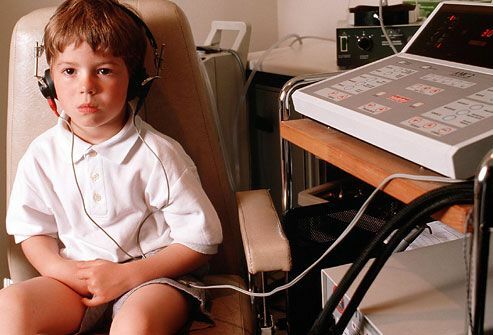 National Institute on Deafness and Other Communication Disorders: "Ear Infections in Children." Sander, R. American Family Physician, March 1, 2001. Spiro, D. JAMA, The Journal of the American Medical Association, Sept. 13, 2006.